You must know the relevant anti spam act if you're in the European Union (including the UK) and carry out text marketing. The Privacy & Electronic Communications Regulations is the main act, and is explained in more detail on the page about anti spam laws. For now, here's how this act affects text marketing, and unsubscribes in particular. 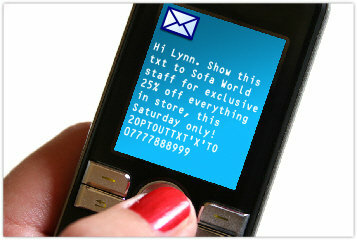 This particular anti spam act treats text marketing and email marketing as the same. Amongst other things, the act states you must include an unsubscribe option in your text marketing campaigns. Where Do the Unsubscribes Go? You’ll need somewhere for customers to send the unsubscribe message. Ideally, your text message service and database would be connected so that customer records are updated automatically. This is the safest way to comply with the anti spam act by removing potential human mistakes. It's done using something called API (Application Programming Interface). Speak to the technicians at your text and database services about this. If your database is relatively small (ie a few thousand), set up a mobile phone to receive the unsubscribe texts. Anti spam laws don't require acknowledgement of the unsubscribe message, so a simple Pay As You Go phone will cost only the initial purchase. A neater way to comply with the act is to obtain a mobile number from your text service that can be used for an RSS (Really Simple Syndication) Feed. This is easy to do. Your service will provide a 7-digit mobile number (our recommended system Txtlocal gives you one free), which is included in every text campaign. When a customer sends the unsubscribe message to that number, it's automatically fed to a webpage and/or email address of your choice. Either way, you must manually update customer records. You won't comply with anti spam laws otherwise! Plus, customers get upset when unsubscribe instructions are ignored. So, compliance with this anti spam act and successful, ethical marketing go hand-in-hand. Anti spam = pro customer! With only 160 characters in a single text message, it’s tempting to ignore the act and omit the unsubscribe line. Don’t! Not only is it illegal, it’s bad customer service too. Someone may want to unsubscribe from your text marketing, but is still happy to receive emails. The lack of a courteous unsubscribe option would only spoil that relationship.